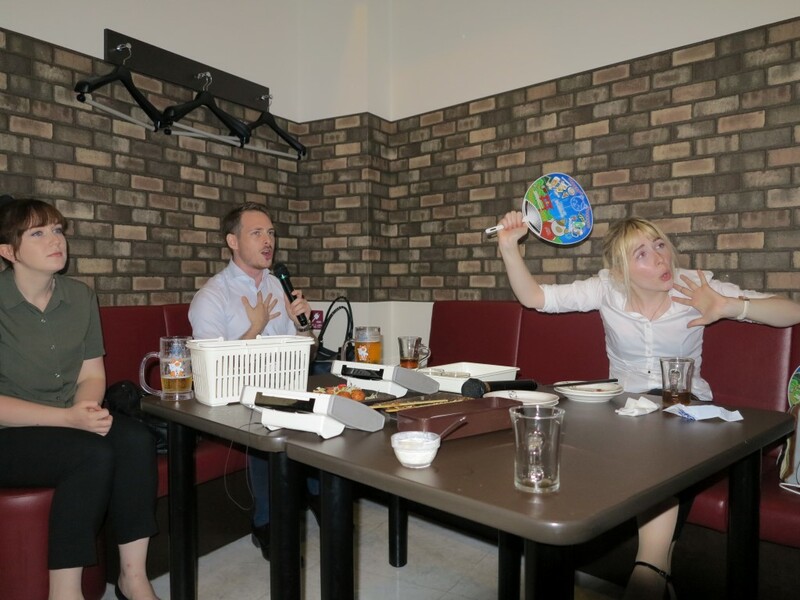 Japan is the birthplace of karaoke, and no trip to the country is complete until you’ve thrown your inhibitions aside and stepped up to the mic. Karaoke machines are common staples at “snack” bars, but by far the preferred setting is the “karaoke box”. 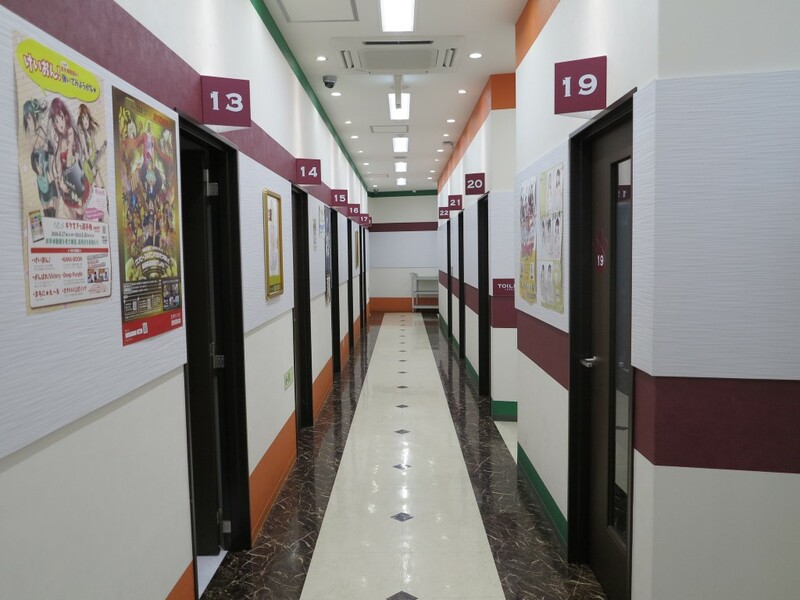 These establishments look a little like hotels, with a reception desk and a collection of private rooms that customers can rent for a specified period. 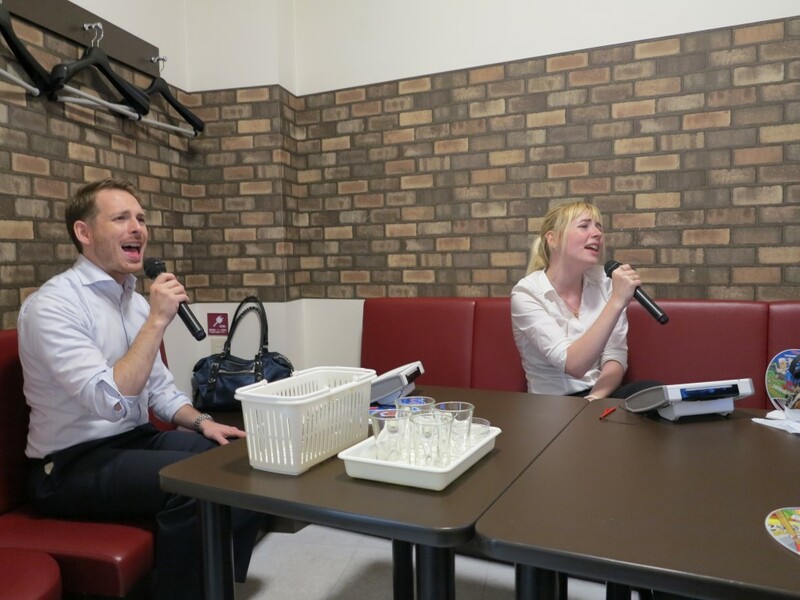 Popular as a stop for groups of friends or coworkers on a night out, karaoke boxes also attract plenty of solo “hitokara” enthusiasts, who practise songs to impress their friends, or simply to enjoy the experience of singing. 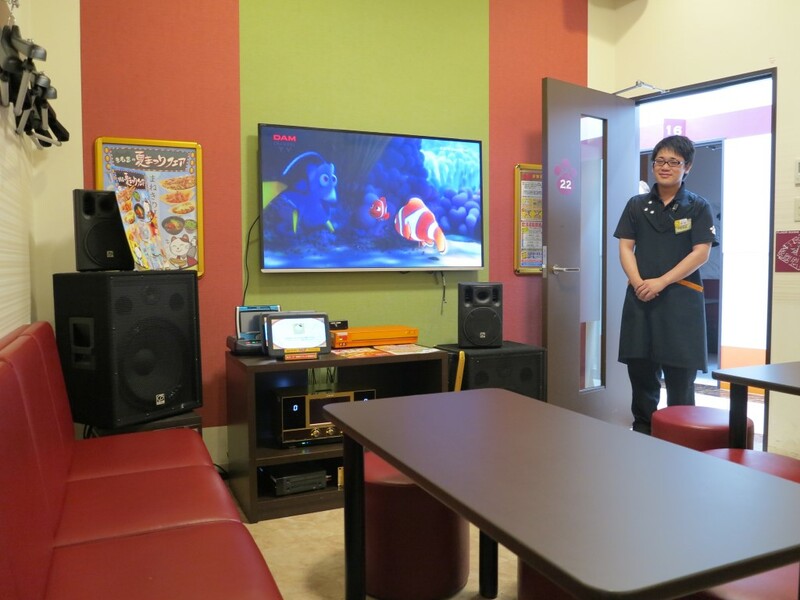 While karaoke box establishments are widespread, visiting one for the first time can be a little daunting, especially given that many companies do not have English guidance. We’ve put together this guide to make it easier for karaoke virgins to experience this Japanese art in its purest form. 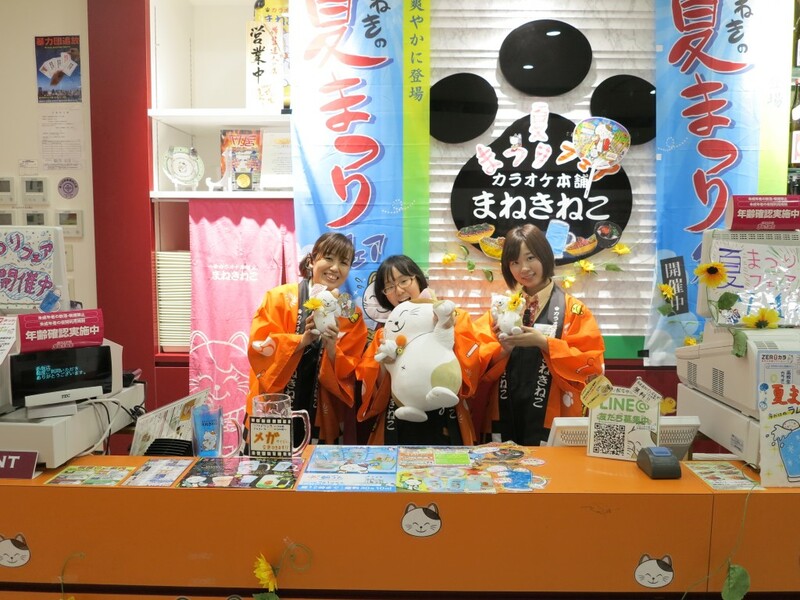 For the purpose of researching this article, we used the Akasaka store of Karaoke Honpo Manekineko, though procedures for most karaoke box stores is the same. It should go without saying that before you can start singing, you’ll need to arrange the details at reception. 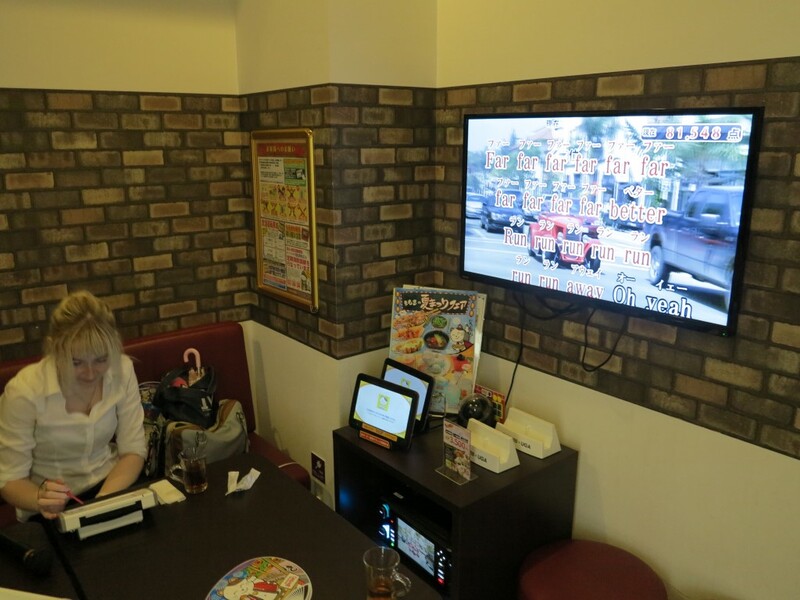 Karaoke box establishments which start on the first/ground floor of a building usually have their reception desk at the entrance. If the store takes up several floors higher up in a building, choose the floor marked “フロント” or “受付” in the elevator. Many large karaoke chains have membership systems which may be compulsory or optional. You may have to provide a form of ID in order to apply. For visitors to Japan, a passport is fine. Room – Rooms may differ in size and by the kind of karaoke machine provided. Generally you can choose which kind of machine you would like if you have a preference (song selection varies between machines), and your room will be selected based on the number of people in your group. You may be able to specify a smoking or non-smoking room, or request a room with specific amenities. Manekineko has rooms with whiteboards on the walls, apparently popular for informal business meetings. Course – Plans vary between companies, but in general the price will be calculated according to the number in your group. 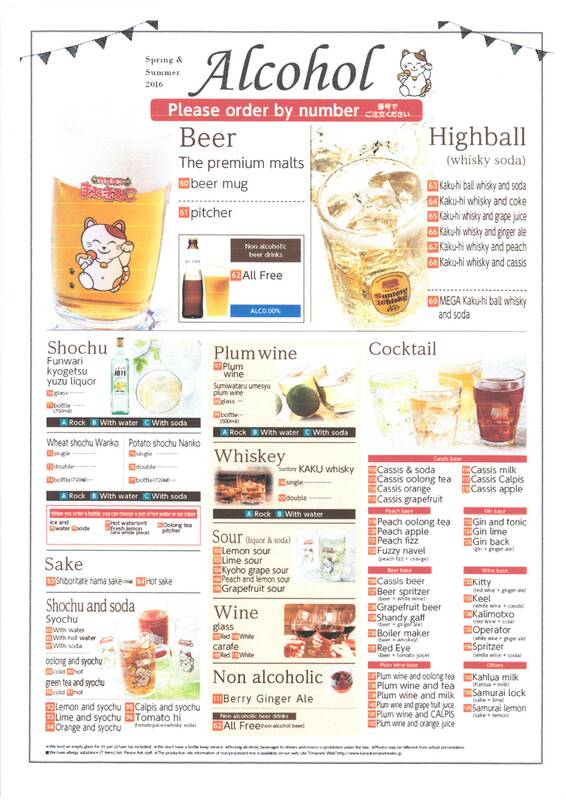 It is common to have a choice between a “one drink” course and a “nomihodai” (all you can drink) course. 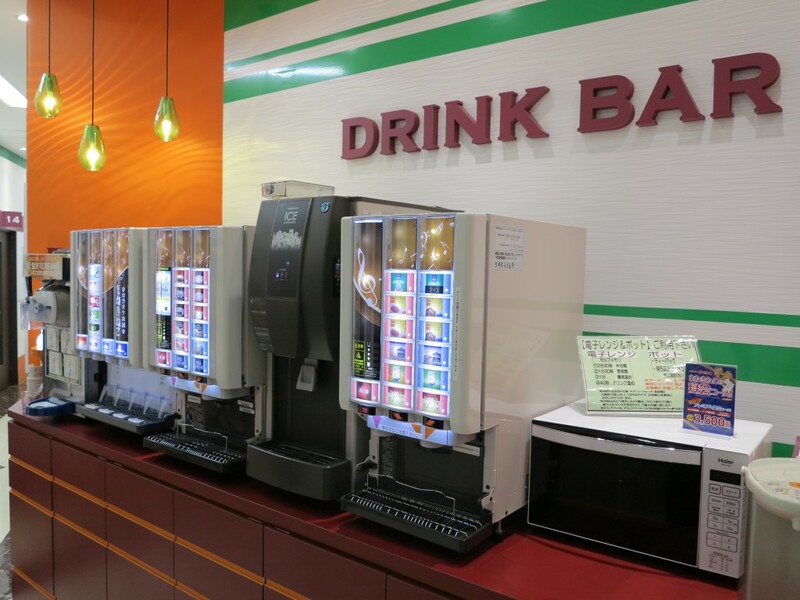 Nomihodai soft drink courses may involve a Drink Bar (see below), and there may be different kinds of alcohol-based nomihodai courses. Plans which include food may also be available. Time – Most karaoke boxes have a minimal rental period of one hour, and you can book in increments of 30 minutes on top of that. Generally you will book the time you want to stay at the start, with the option of extending later. Some stores offer “free time”, which are periods where you can pay a flat fee and use the room until the “free time” period ends. If you think you will be staying for a while, taking advantage of “free time” offers may save you money. You may be shown to your room by staff, or given the room number to locate it yourself. You’ll find microphones and control panels for the karaoke machine inside. You can set various volume levels on the machine itself, and adjust the light levels in the room to your preference. Manekineko has a function allowing you to connect a device up to the screen, to stream music from popular video sites to sing along to. 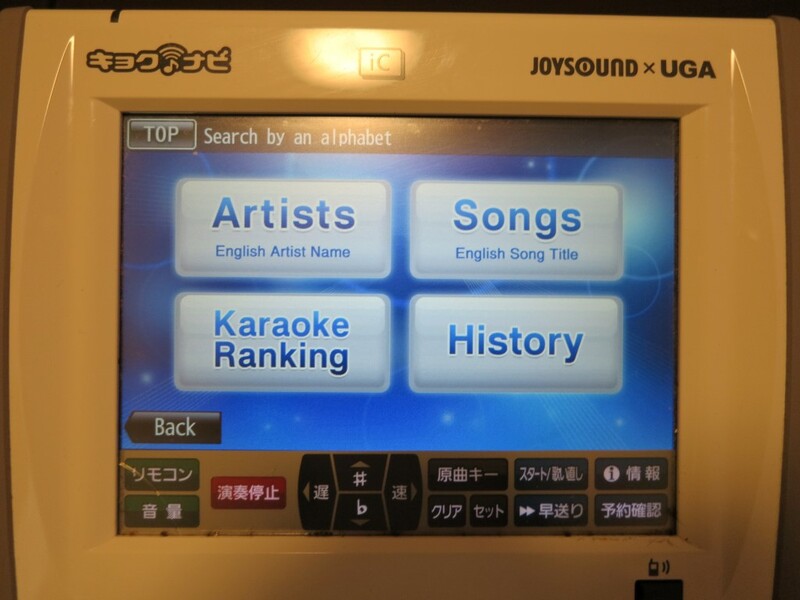 Most modern karaoke machines are controlled via a touch screen panel with a stylus. There is usually an English language option, though there are often fewer functions available than with the Japanese language setting. You can search for songs by title or by artist, with popular selections often appearing as you type. If you read Japanese, you can choose songs by genre, with common options including anime songs, duets and “本人映像” (honnin eizou) featuring the song’s original music video. 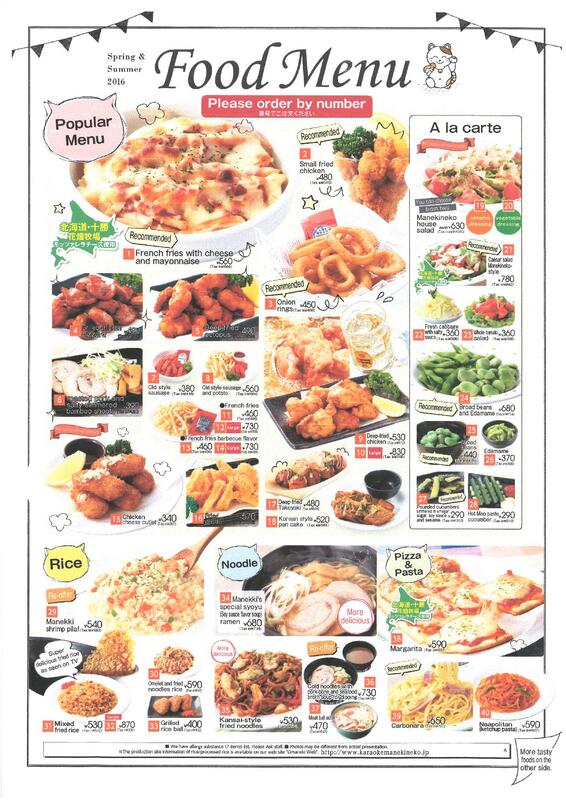 Food and drink systems differ by karaoke company. 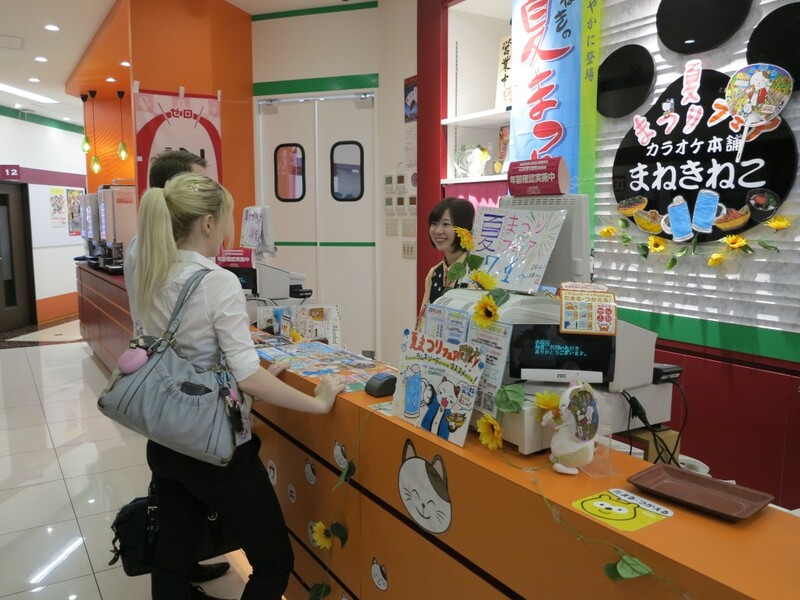 At Manekineko for instance, there is a family restaurant style self-service drink bar, which also has soft ice cream. Other food items and alcohol can be ordered via a remote in the room, which may be separate from the remote for the karaoke machine. Other stores may do drink orders via the room’s telephone. The Manekineko Akasaka store has a large wine, nihonshu (sake) and shochu selection. 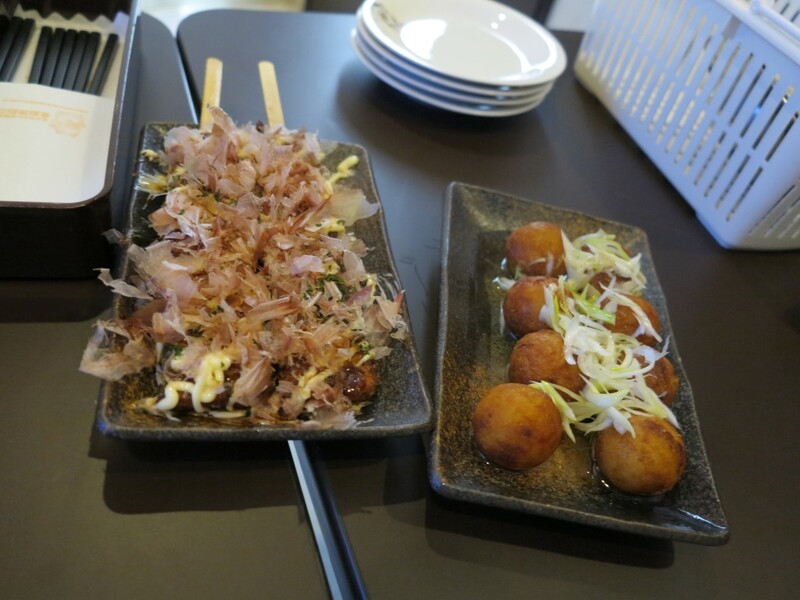 At some Manekineko stores, customers are allowed to bring in their own food from outside. This part is self explanatory. Remember that you can change mic volumes, reverb and other settings depending on your personal preferences. Usually you will get a call to the room 10 minutes before your time is up. Assuming the store is staying open and there are no customers waiting, it is usually possible to extend if you wish. If not, be sure to head back to reception when your time is up. Your start time is usually displayed on the receipt strip given to you when you arrived. Take this with you when you go. Return to reception and hand over your receipt. You will be charged based on the plan you chose and any food and drink you ordered. And that’s it! While different companies may have different features and facilities, the basics are the same across the board.